The creatures now visit over 150 nursing homes, dementia units and day centres for the elderly and disabled, since our very first visit to a local nursing home in 2011. Our one on one approach ensures everyone can interact with a selection of scaly, furry, creepy crawly and feathered creatures, in a way that is accessible to their individual needs. We also offer lounge and room visit options. Reptile & creepy crawly team are a big hit. The reactions, songs and stories that the animals inspire, during their visits, never ceases to amaze us and the care staff on duty. We visit day centres across Dorset, Hampshire and Wiltshire, and visit care homes that are under the banner of Sunrise Senior Living, Colten Care, B.U.P.A., Order of St John's, Brighterkind, Care South, as well as many smaller and privately owned homes. All of our clients have stayed with us over the years, all booking multiple visits across the year, several booking a visit as often as once a month. Echo the barn owl will fly to residents in their bed if they can't make it to the lounge. We offer lounge visits, room visits, or a combination of the two, we offer open day mingles introducing the animals to visitors, and we offer themed appearances at Halloween, dressed as witches, and Christmas, dressed as elves, where appropriate. A picture is worth a thousand words. Our animals appear in photos on many bedroom walls. These encounters cost £95 per hour for up to 25 handlers. The Creature Teacher staff present will interact with each resident/service user, introducing each animal and ensuring everyone has one on one time with up to 5 different types of animals. You will receive £5 off your first booking with us. Discounts are available for multiple bookings across the year. Please note there will be a fuel charge. Get in touch for your full quote. We will discuss with you the options that would work best for your group, during the booking process and, together, we will design a visit to suit your needs. Take a look at our animal team HERE, or check our frequently asked questions page HERE. 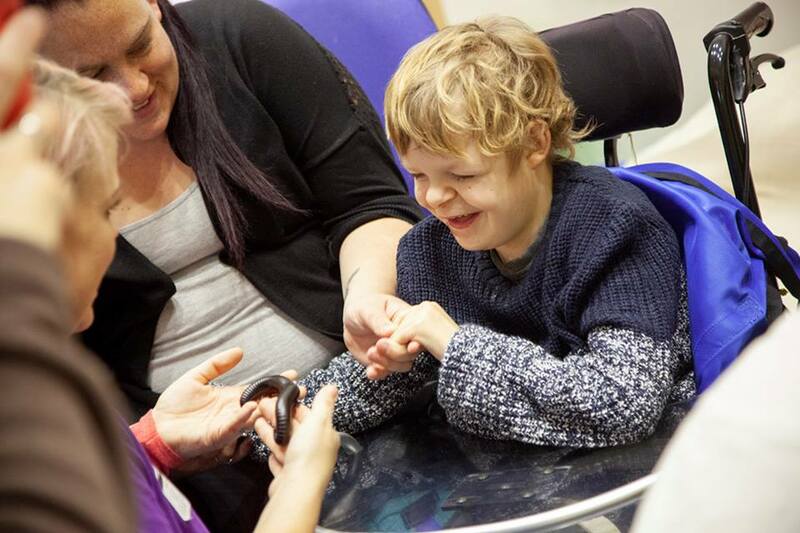 The creatures have met lots of children, young people and adults over the years with a range of severe, profound and complex sensory impairments, physical, and learning difficulties. The team works closely with staff and parents present, during the encounter, to ensure that everyone gets the most from the one to one approach. A range of creatures and two Creature Teachers come along, so each handler gets the opportunity to get the most personalised experience possible during this multi-sensory experience. Everyone gets hands on with all of the creatures. This encounter is charged at an hourly rate of £95, with the duration of each session dependent on what works best for your learners and service users. We will discuss the best way to arrange the visit when you get in touch. Please note a travel charge will be added.